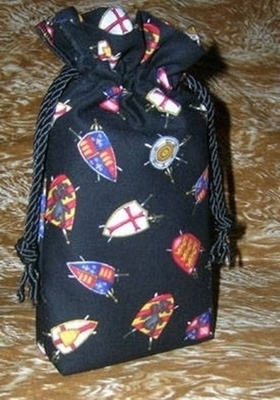 Double Draw Tarot Bags - Sword & Shield Double Draw Bag - Tarot Bags, Tarot Cards, Cloths, & More! Shield your cards from negativity and unwanted influences! 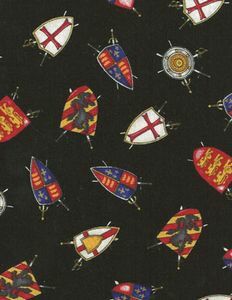 Featuring seven different historical shields backed by various crossed swords, this medieval themed pattern is ideally suited for keeping your tarot cards safe. Shields, of course, represent defensive energy and swords symbolize (among many other things), the animus or the active principle. The two combined are a potent symbol of protection. This bag coordinate with any deck that has swords or shields on some of the cards which, of course, includes most tarot decks, doesn't it?